One of the challenges met by green entrepreneurs and product developers who have tried to develop more sustainable products is that efforts to have better products in environmental terms do not always translate into effective business cases. The purpose of this book is a better understanding of the implications of environmental issues in new product development. 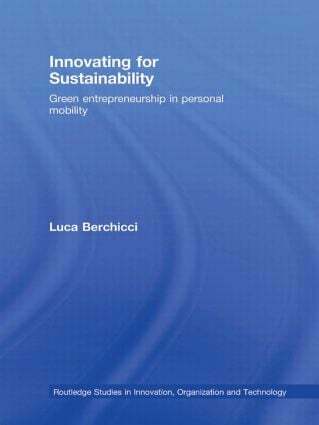 Through an empirical study in the human powered vehicle sector, Luca Berchicci examines how and to what extent the environmental ambition of product developers and managers influences the way new products and services are developed. The understanding of this phenomenon is particularly important since managers are encouraged and/or motivated to undertake environmental new product development projects. From the descriptions and analyses of the two cases study Luca Berchicci suggests that a high level of environmental ambition increases the complexity of the product innovation process. Moreover, a high level of environmental ambition may hamper a product innovation process because it may lead the developers away from the market that their product is to serve. Accordingly, this book attempts to explain and predict how environmental ambition influences new product development processes. This claim provides a theoretical contribution to existing research in both product innovation and green product innovation. Moreover, this book provides an original and deep insight on the diverse facets of greening. Organizing for innovation: How do firms innovate?